From the Department of Family and Community Medicine, University of California, San Francisco, School of Medicine; San Francisco (DHT, RW-G, DH, DD, CP, TB, EC); and the Silver Avenue Health Center, San Francisco, CA (EC). Background: Lack of concordance between medications listed in the medical record and taken by the patient contributes to poor outcomes. We sought to determine whether patients who received health coaching by medical assistants improved their medication concordance and adherence. Methods: This was a nonblinded, randomized, controlled, pragmatic intervention trial. English- or Spanish-speaking patients, age 18 to 75 years, with poorly controlled type 2 diabetes, hypertension, and/or hyperlipidemia were enrolled from 2 urban safety net clinics and randomized to receive 12 months of health coaching versus usual care. Results: Outcomes included concordance between medications documented in the medical record and those reported by the patient and adherence based on the patient-reported number of days (of the last 7) on which patient took all prescribed medications. The proportion of medications completely concordant increased in the coached group versus the usual care group (difference in change, 10%; P = .05). The proportion of medications listed in the chart but not taken significantly decreased in the coached group compared with the usual care group (difference in change, 17%; P = .013). The mean number of adherent days increased in the coached but not in the usual care group (difference in change, 1.08; P < .001). Conclusions: Health coaching by medical assistants significantly increases medication concordance and adherence. A number of factors contribute to poor medication concordance and adherence, including poor understanding among patients of which medications they should take and how they should be taking them.29 Health coaches are increasingly used in primary care and other settings, primarily to help patients improve control of one or more chronic conditions, and they may provide an important resource to improve medication concordance and adherence and thereby reduce medication errors. In our model health coaches are medical assistants who work in the clinic and have received additional training that includes training in medication reconciliation, adherence counseling, and collaborative communication. However, little is known about whether medication counseling conducted by unlicensed professionals in the outpatient setting improves medication concordance and adherence. We investigated the impact of medication counseling provided by health coaches on medication concordance and adherence in the context of a randomized controlled trial of health coaching versus usual care for patients with uncontrolled diabetes, hyperlipidemia, and/or hypertension. The Health Coaching in Primary Care (HCPC) study was a pragmatic, randomized, controlled trial of 12 months of health coaching versus usual care for low-income patients with uncontrolled type 2 diabetes, hypertension, and/or hyperlipidemia. A detailed description of the HCPC study design and methods has previously been published.30,31 The primary outcome of the HCPC study was the proportion of patients who at 12 months had achieved control of at least one of the conditions that was uncontrolled at baseline. The study also assessed medication concordance and adherence in both study arms at baseline and at 12 months. This article reports the impact of health coaching on medication adherence and concordance. The study protocol and materials were approved by the University of California, San Francisco, Committee on Human Research (approval no. 10-02813), and the study was registered at clinicaltrials.gov (identifier NCT01220336). The study was conducted between March 2011 and May 2013 at 2 community “safety-net” health centers in San Francisco that serve low-income, largely uninsured or publically insured patients. Potential participants were English- or Spanish-speaking patients identified through chronic disease registries. Patients were considered eligible if they were between ages of 18 and 75, spoke Spanish or English, could be reached by phone, and had poorly controlled diabetes (HbA1c ≥8.0%), hypertension (systolic blood pressure ≥140 mmHg), or hyperlipidemia (low-density lipoprotein ≥160 mg/dL for nondiabetic patients or ≥100 mg/dL for diabetic patients). Primary care clinicians identified patients who should be excluded from the study because of serious health conditions or behavioral health issues that would preclude working with a health coach, such as uncontrolled schizophrenia. The remaining patients were approached by letter, phone, and in person to be screened further and invited to take part in the study. Patients providing informed consent were enrolled in the study, at which time research assistants conducted a 45-minute verbal survey and updated clinical measures. A random binary sequence stratified by diabetes diagnosis was generated using the random number function in Excel (Microsoft Corp., Redmond, WA) and used to order study arm assignment into sequentially numbered envelopes. After completing baseline measures, the patient was given the next envelope in the sequence, assigning him or her to receive health coaching or usual care. Patients assigned to the coaching arm were introduced to their coach by the research assistant. Thus research assistants were not blinded to study arm assignment at the 12-month follow-up data collection. Analyses in this article also were not blinded. Health coaches were 3 medical assistants who attended 40 hours of health coach training over 6 weeks using a curriculum developed by the study team. The curriculum included instruction on reconciling medications, which was defined as gathering information on patient knowledge and use of medications and alerting the primary care provider to discrepancies between chart-listed and patient-reported use of the medication or patient misunderstanding of the purpose of the medication. Medication reconciliation did not entail starting, stopping, or titrating medications without provider instruction, and health coaches were trained not to provide any medical advice. Health coaches were required to pass written and oral exams regarding medications, and they received subsequent skills checks and observations to ensure knowledge was retained. In addition, the curriculum included instruction in using active listening and nonjudgmental communication; helping with self-management skills for diabetes, hypertension, and hyperlipidemia; providing social and emotional support; assisting with lifestyle change; facilitating medication understanding and adherence; navigating the clinic; and accessing community resources. Health coaches interacted with patients at medical visits, at individual visits, and during phone calls. The minimum required frequency of contact was once every 3 months for in-person visits (often as part of a medical visit) and monthly for additional contacts such as phone calls. During the medical visit, the health coach met with the patient before the visit for medication reconciliation, setting an agenda, and reviewing laboratory test results. During medication reconciliation, the health coach reviewed each medication in the medication list to ensure that the patient knew the name, purpose, strength, and dosage of the medications. The health coach assessed adherence to the prescription instructions and asked questions to identify barriers to adherence (eg, forgetting to pick up/to take medications, lack of belief in the importance of medications). The results of medication reconciliation were summarized on a form that was handed to the primary care provider when he or she entered the examination room. The health coach highlighted and summarized key findings, such as a medication that was in the chart but was not being taken by the patient, medication dosages or purposes that were misunderstood, barriers to medication adherence, and successes in improving adherence. Primary care providers retained responsibility for starting, stopping, or titrating medications. Patients randomized to usual care continued to have visits with their clinician over the course of the 12-month period and had access to any additional resources that were part of usual care at the clinic. Patient demographic characteristics and other characteristics were assessed by survey at the time of enrollment. Medication concordance of prescription medications for diabetes, hyperlipidemia, and hypertension was assessed by the research assistant at baseline and at the 12-month follow-up visit. At those times, a trained research assistant recorded patient-reported medications by asking the patient to bring in all medications they were using or, if that was not possible, to make a list of all medications they were using, including the drug name, dose, and frequency. In cases where the patient did not bring either their medications or a list of their medications to the meeting with the research assistant, the research assistant arranged to call the patient at home and have the patient read the labels from their medication bottles. Immediately after meeting with or talking to the patient, the research assistant abstracted the medical record to obtain a list of current medications (“charted medications”) for treatment of hypertension, hyperlipidemia, and diabetes, including the medication name, dose, and frequency. The research assistants were trained by the study investigators and used a comprehensive reference list of qualifying medications. In cases where a medication could be used for another condition and the medical record did not state for what condition it was used, one of the clinical investigators reviewed the medical record to make a determination. Medication concordance refers to the degree to which the medications listed in the medical record correspond to the medications patients are actually taking and how they are taken (ie, dose, route, and frequency); however, there is no established measure of the degree of medication concordance. In keeping with definitions used by previous investigators, we used 4 dichotomous variables to measure different types of concordance and nonconcordance. “Complete concordance” was defined as the medications listed in the medical record and those reported by the patient being identical in drug name, dose, and frequency. “Concordant by name” refers to the medication being both listed both in the medical record and reported by the patient, regardless of any difference by dose and/or frequency. We also examined 2 types of nonconcordance: patient-reported medications not listed in the medical record and medications listed in the medical record but not reported by the patient. We then calculated the proportion of all medications meeting each definition. Medication adherence was ascertained at the same time as concordance by asking the participant, for each medication, “In the past 7 days, how many days did you take this medicine exactly as it was prescribed?” A mean of the number of days of adherence across all medications was calculated for each patient. Medication adherence was analyzed both as a continuous variable (the mean number of days of medication adherence in the past 7 days) and as 2 dichotomous (yes/no) variables: “perfect adherence,” defined as having taken every medication as prescribed every day for the past 7 days, and “good adherence,” defined as having taken medications as prescribed for an average of at least 5 of the past 7 days. Analyses were by intention to treat and in accordance with the CONSORT guidelines for reporting results from clinical trials.32 Baseline differences across the treatment groups and attrition analyses were conducted using the χ2 test for categorical data and analysis of variance for normally distributed continuous variables. Linear and logistic regression analyses were specified to test for main treatment group effects on change from baseline to 12-month follow-up. Baseline levels of outcomes were explored as an additional covariate in regression models, as appropriate. Missing data were treated as missing (not imputed). All P values are 2-sided. Statistical analyses were performed using SPSS software version 19.0 (IBM Corp., Chicago, IL). A total of 664 eligible patients were identified at the 2 clinic sites, of whom 441 (66.4%) consented to participate and were enrolled (Figure 1). After enrollment and completion of baseline measures, participants were randomized to the health coaching arm (n = 224) or the usual care arm (n = 217). The attrition rate was lower in the health coaching intervention arm than the usual care arm (7.1% vs 16.1%; P = .003). Attrition status was not related to any demographic or outcome variable, and there were no significant between-group differences in attrition with the exception of baseline HbA1c: Participants who were lost to follow-up had higher HbA1c in the control arm then in the coaching arm (10.5% [1.3%] vs 9.2% [0.4%]; P = .03). Consolidate Standards of Reporting Trials (CONSORT) diagram showing study enrollment and follow-up. A total of 288 participants had at least 1 medication identified by medical record review or self-report both at baseline and the 12-month follow-up, and thus provided data for the current analyses. Demographic characteristics of participants or the number of baseline medications did not significantly differ between study arms (Table 1). Participants' mean age was 53 years. The majority of participants were Latino/Hispanic, followed by black/African American as the next largest group. Consistent with the safety-net setting, the majority of participants reported an annual household income of <$10,000. Compared with usual care, patients receiving health coaching had a significantly greater increase in the proportion of medications for which there was complete concordance of name, dose, and frequency (10% more than usual care) and name-only concordance (11% more than usual care; Table 2). In addition, coached patients experienced a significant decrease in the proportion of medications listed in the medical record but not reported by the patient (17% larger reduction than usual care). Coaching had no significant effect on the proportion of medications reported by the patient but not listed in the medical record, possibly because this proportion was already quite low at baseline. Self-reported adherence improved significantly more in the coached group compared with the usual care group (Table 3). The mean number of days of adherence in the past 7 days increased by a day in the coached group versus the usual care group. Patients in the coached group were more likely to report “good adherence” (taking medications as prescribed for an average of at least 5 of the past 7 days). The percentage of patients who reported taking medications as prescribed every day in past 7 days also increased more in the coached group, but this difference was not significant. The results of this study suggest that medication counseling provided by trained medical assistant health coaches improves medication concordance and increases adherence. To our knowledge, this is the first randomized controlled trial to examine the effect of medication counseling conducted by unlicensed professionals in the outpatient setting. Moreover, in the absence of standard methods for defining and measuring concordance, this study offers a potential method to assess this vital indicator. The study had several limitations. We investigated concordance only for medications prescribed for the 3 conditions targeted by the study: diabetes, hyperlipidemia, and hypertension. Thus we did not include medications for other conditions or nonprescription (over-the-counter) medications in our analyses. Medication reconciliation was only one of the activities performed by the health coaches; thus identifying which coaching activities improved concordance or adherence is not possible. Medication adherence was assessed by patient self-report and may overestimate true adherence. Although research assistants collected baseline data before study arm assignment and did not have contact with study participants between randomization and the 12-month data collection, they were not actually blinded to study arm assignment, which could have introduced unconscious biases to data collection at 12 months. Finally, the study population comprised low-income patients seen in public safety-net clinics and may not be generalizable to all patients. Health coaching involves engaging patients in their own care by helping them gain the knowledge, skills, and confidence to become active, informed participants in the management of their chronic condition. These functions of health coaching are similar to the interventions known to improve medication adherence: patient knowledge, patient counseling, and active patient participation.2 Medical assistant health coaching could prove to be a promising strategy to improve medication concordance and adherence, particularly in resource-poor settings. With a median salary less than a third that of pharmacists, medical assistant health coaches could be a resource for practices who are unable to avail themselves of the help of a pharmacist. Moreover, the medical assistant workforce is more culturally and linguistically diverse than other health professionals and thus may be more concordant with patients. As a result, patients may be more willing to be honest with health coaches about a lack of understanding about, or poor adherence to, medications. There is some evidence that patients may also increase their trust in their primary care provider as a result of working a health coach31; trust in a provider is a known predictor of medication adherence.33 In addition, medical assistants in their health coaching role have more time to spend with patients, assisting them in understanding their medications, engaging them in discussions of adherence, and encouraging them to be actively engaged in their care. Health coaching by medical assistants increased medication concordance and adherence compared with usual care. Medical assistants trained in health coaching, including medication counseling, can increase both concordance and adherence for low-income patients with diabetes, hypertension, or hyperlipidemia. The authors gratefully acknowledge the work of health coaches Christina Araujo, Adriana Najmabadi, and Dalia Canizalez; study research assistants Marissa Pimental and Danielle Messick; as well as the support of medical directors Dr. Elsa Tsutaoka and Dr. Ricardo Alvarez and the staff at the participating clinics. Funding: This study was supported by a grant from the Gordon and Betty Moore Foundation (grant no. 2492) (co-principal investigators Dr. Thom and Dr. Chen) and with support from the UCSF Family and Community Medicine Center for Excellence in Primary Care and the San Francisco Bay Area Collaborative Research Network. ↵* Michelle Chung, data analyst for the Department of Health and Human Services, personal communication, Dec. 13, 2013. Received for publication April 20, 2014. Revision received September 13, 2014. Accepted for publication September 25, 2014. IMS Institute for Healthcare Informatics. Avoidable costs in U.S. healthcare: the $200 billion opportunity from using medications more responsibly. June 2013. Available from: http://www.imshealth.com/deployedfiles/imshealth/Global/Content/Corporate/IMS%20Institute/RUOM-2013/IHII_Responsible_Use_Medicines_2013.pdf. Accessed December 1, 2013.
. Ingredients of successful interventions to improve medication adherence. JAMA 2013;310:2611–2. Institute of Medicine. To err is human: building a safer health system. Washington, DC: National Academies Press; 1999. Institute of Medicine. Preventing medication errors: quality chasm series. Washington, DC: National Academies Press; 2006. The Joint Commission. National patient safety goals effective January 1, 2014. Available from: http://www.jointcommission.org/assets/1/6/AHC_NPSG_Chapter_2014.pdf. Accessed March 31, 2014.
, eds. Preventing medication errors. Washington, DC: Institute of Medicine, National Academies Press; 2007.
. Adverse drug events in ambulatory care. N Engl J Med 2003;348:1556–64.
. Medication reconciliation: a prospective study in an internal medicine unit. Drugs Aging 2014;31:387–9.
. Comparison of hospital admission medication lists with primary care physician and outpatient pharmacy lists. J Nurs Scholarsh 2011;43:292–300.
. Unintended medication discrepancies at the time of hospital admission. Arch Intern Med 2005;165:424–9.
. Implementation of admission medication reconciliation at two academic health sciences centres: challenges and success factors. Healthc Q 2009;12 Spec No Patient:102–9.
. Impact of pharmacist-conducted medication reconciliation at discharge on readmissions of elderly patients with COPD. Ann Pharmacother 2014;48:203–8.
. Medication reconciliation: a practical tool to reduce the risk of medication errors. J Crit Care 2003;18:201–5.
. Standardization as a mechanism to improve safety in health care. Jt Comm J Qual Saf 2004;30:5–14.
. Medication reconciliation in a community pharmacy setting. J Am Pharm Assoc 2010;50:523–6.
. Sources and types of discrepancies between electronic medical records and actual outpatient medication use. J Manag Care Pharm 2008;14:626–31.
. Predictors of completeness of patients' self-reported personal medication lists and discrepancies with clinic medication lists. Ann Pharmacother 2014;48:168–77.
. Identifying discrepancies in electronic medical records through pharmacist medication reconciliation. J Am Pharm Assoc 2012;52:59–66.
. Medication discrepancies in an outpatient electronic medical record. Am J Health Syst Pharm 2001;58:2072–5.
. Medication discrepancies in integrated electronic health records. BMJ Qual Saf 2013;22:103–9.
. Medication reconciliation by clinical pharmacists in an outpatient family medicine clinic. J Am Pharm Assoc 2003;54:181–7.
. Medication documentation in a primary care network serving North Carolina Medicaid patients: results of a cross-sectional chart review. BMC Fam Pract 2012;13:83.
. Evaluation of medication reconciliation in an ambulatory setting before and after pharmacist intervention. J Am Pharm Assoc 2010;50:490–5.
. Implementation of a medication reconciliation process in an ambulatory internal medicine clinic. Qual Saf Health Care 2007;16:90–4.
. Medication reconciliation in ambulatory care: attempts at improvement. Qual Saf Health Care 2009;18:402–7.
. Improving medication reconciliation in the outpatient setting. Jt Comm J Qual Patient Saf 2007;33:286–92.
. US pharmacists' effect as team members on patient care: systematic review and meta-analyses. Med Care 2010;48:923–923.
. The impact of clinical pharmacy services integrated into medical homes on diabetes-related clinical outcomes. Ann Pharmacother 2010;44:1877–86.
. Integrating medication therapy management in the primary care medical home: a review of randomized controlled trials. Am J Health Syst Pharm 2011;68:335–45.
. 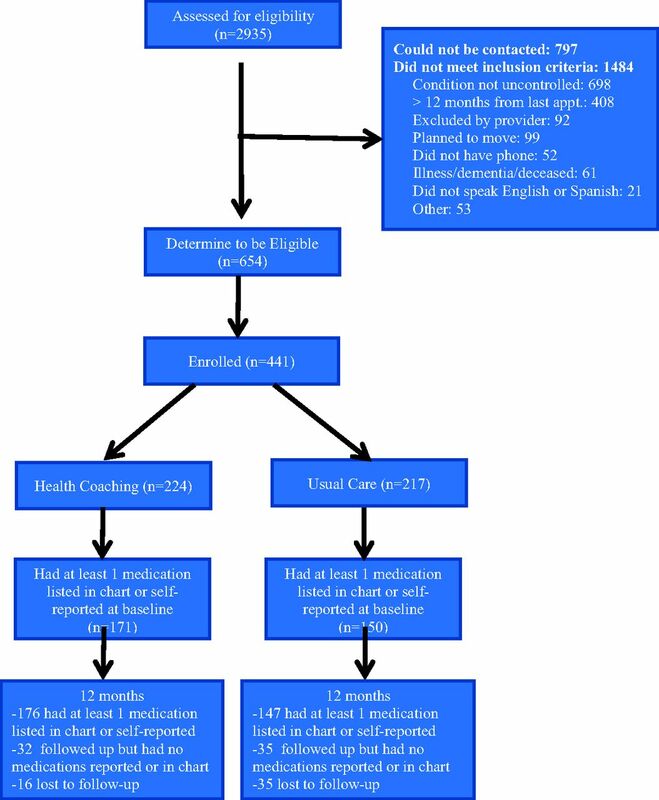 The effectiveness of medical assistant health coaching in the primary care setting for low-income patients with uncontrolled diabetes, hypertension, and hyperlipidemia: protocol for a randomized controlled trial. BMC Fam Pract 2013;14:27.
. Does health coaching impact patients' trust in their primary care provider? Patient Educ Couns 2014;96:135–8. ; CONSORT Group. CONSORT 2010 statement: updated guidelines for reporting parallel group randomized trials. Ann Intern Med 2010;152:726–32.
. Measuring patient's trust in physicians when assessing quality of care. Health Aff (Millwood) 2004;23:124–32.